The Days of Johann, an agility dog! : Black and White Sunday: Broken foot? Black and White Sunday: Broken foot? Back in 2007, Mum boarded me and Gracie when she had to go to Las Vegas for work for four days. It was the first and only time that Mum has boarded us, because I got a broken foot while in their care. Can you see the break? Since I am an agility dog, I had a great orthopedic surgeon help me even though I didn't need to have surgery. They didn't want to put a pin in my foot because of how the weather may affect my agility career (those pins get cold in cold weather and can hurt sometimes). So they put me in a cast up to my shoulder for three months to be certain that it healed properly. Nearly every week, I'd go in and have the cast re-positioned because the up and down swelling would make it move. I'll never forget my Ortho, down on the floor with a grinder, grinding away at my cast every week, so that it wouldn't make any bad rub spots on my leg. What a great guy! After being in a cast that long I had a lot of rehab to do to build up all the muscle mass I had lost on that side of my body. But with the help of my rehab vet, lots of underwater treadmill work, and unbalance/balance work, I was back running in agility in a total of about seven months from the date of injury. Obviously Mum didn't take this B&W photo....the nice orthopedic surgeon that worked with me back in Indianapolis did and then he let us have a copy of the x-ray to take home. 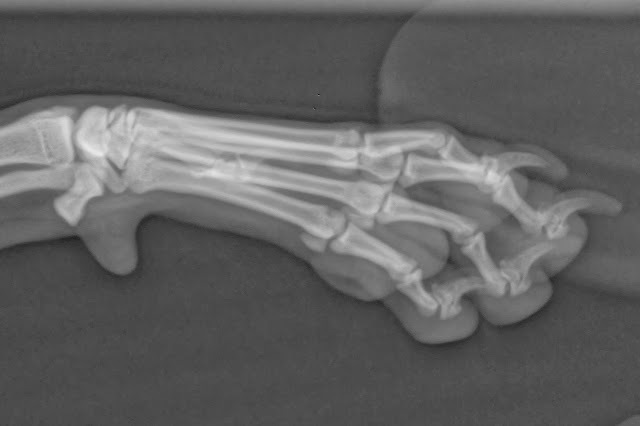 We thought you would find an x-ray of a broken foot pretty doggone interesting. When I got back to running agility, my first Q was a 1st in Masters Jumpers in USDAA. So what did I do? I went the next day to visit my ortho and gave him my blue ribbon, as a big thank you for helping me out. He liked it, a lot...he even got a tear I think. The xray is really interesting to look at. I bet your dr was proud as punch with you for winning the blue. So happy your foot healed properly. I had no idea. Wow. Yes. I an clearly see the break. I can't believe it happened while you were boarded. So glad you had a good vet to care for you! Big OUCH! That looked like a bad break. SO glad you were able to get back to your agility and how nice of you to go thanks your vet! What a great thing to give your Dr! It sounds like you all worked great together to get that thing healed up perfectly. Teamwork! Congratulations on healing, and on the ribbon. That was so sweet of you to give the ribbon to your vet. So lucky you found that great vet! Ouch! That looks like it hurt! I bet your Mom was very upset. I would've been. I tend to get more upset than my pets do when they're hurt or sick, heh. I'm glad you had such a wonderful vet to help you heal up properly so that you could continue to do agility! That was so sweet of you to give your vet your ribbon. cool photo (i'm a vet tech so thought it was way cool)bad break and so glad you healed up nicely without surgery and way to go getting that blue ribbon! That must have been so upsetting to realise the foot was broken. But it all turned out well in the end, thank God.